Unbelievable as it may seem, my favorite browser Mozilla Firefox has become a memory hog. Now, 512Mb of RAM feels inadequate as I watch my FreeRAM XP icon show dwindling numbers whenever I fire up Firefox. I'm not thinking of using Internet Explorer 7 even as Windows Task Manager shows Firefox's memory usage running up to over 70Mb. Well, it's not really the memory usage that bothers me. It's the overall sluggishness of Firefox that prompted me to look for a better alternative. So I then tried a likely candidate, Apple Safari, on my computer running Windows XP; Safari didn't work the way I expected it to. Anyway, it's not as hopeless as it seems. 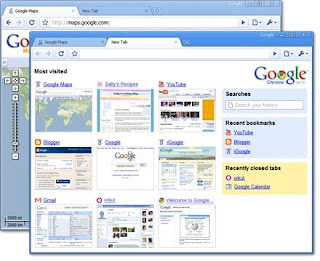 Google has released the Beta version of its Chrome browser, and from the looks of it, even a Pentium III 500 processor will run the application like it's supercharged. IMHO, aside from being secure and fast, the best browser should be backward compatible with every processor that's online; the farther back the better. Yes, there are still Pentium II computers (or even older?) out there surfing the Web. I downloaded and installed Google Chrome, and after getting slightly disoriented, I found my way and started browsing my favorite sites. After playing around with the browser, I must tell you that I'm impressed with the speed Google Chrome starts up and displays a Web site. I thought Mozilla Firefox was going to be the end of my quest for browsers, but it looks like Google's browser is now the best so far for all-purpose browsing. A look at Windows Task Manager will show that the browser breaks up its processes into two or three sub-processes, which I believe contributes to its speed. One thing I noticed though is after installing Google Chrome as administrator in Windows XP, I found out that limited account users do not have the browser installed, so I had to install it again using the other accounts. It's a good thing my desktop and my laptop both have only two accounts in Windows XP. Another behavior I found strange was that when I used the Google site to download Chrome and the site was in my native language, the version downloaded and installed was also in that language (awkward because there were still many non-translatable words such as "download" -- and if a word was translated, it sounded like it was out of context or too profound). I didn't have a choice to convert the browser into English (or maybe I just didn't know how to do it). To get around this, I merely downloaded the English version from a Google page in English and then did a re-install. I should've been given a choice as to what language I want my browser to be in, or the browser should've had an option to switch from a native language to English or vice versa. I'm not quite ready to ditch my Mozilla Firefox because it's got all the useful extensions I need to accomplish specific tasks, including work-related activities. Still, I believe Google Chrome is the way to go for surfing fun. So what are you waiting for? It's here. Go take it for a spin. You'll love it. Before I forget, make sure you right click on the "Other bookmarks" icon and select "Always show bookmarks bar." Also make sure that your browser gives off information about usage and bugs to help developers improve this Beta version. Finally, the Home button can be made visible by checking the box in Options -->Basics-->Home page-->Show Home button on the toolbar. To delete the "Most visited" bookmarks, simply left-click on the icon that resembles a wrench, choose Clear browsing data... then click on the drop-down menu Clear data from this period: and choose Everything. You can also go on incognito mode if you don't want your browsing history to show up anywhere. It looks like the Recent bookmarks can't be deleted, and organizing your bookmarks isn't as easy as it is with Firefox.